In stock 212 items in stock. This is the kind of 1/4" stereo jack you might find in home stereos and PA systems. Switched contacts allow you to detect whether or not there is something plugged in to the jack. 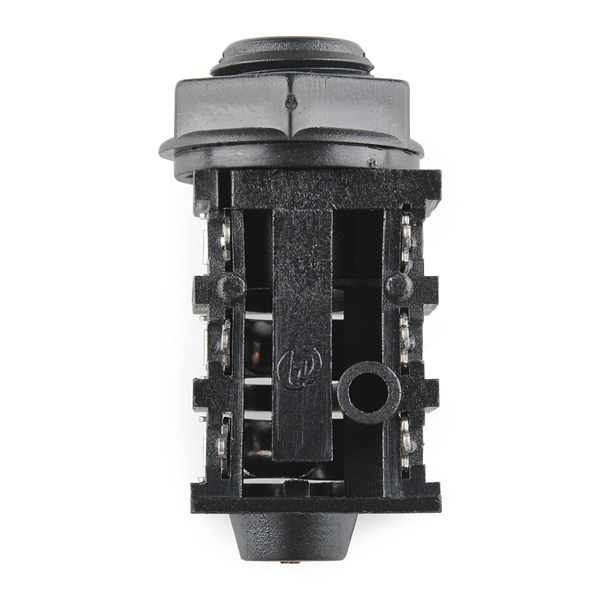 The jack can be panel mounted in an 11mm diameter hole. Note: Looking for a breakout to hook this audio jack up to your project a little easier? Check out the SparkFun TRS Jack Breakout! I am looking in the eagle libraries and can not find this item. Would someone please help me out? 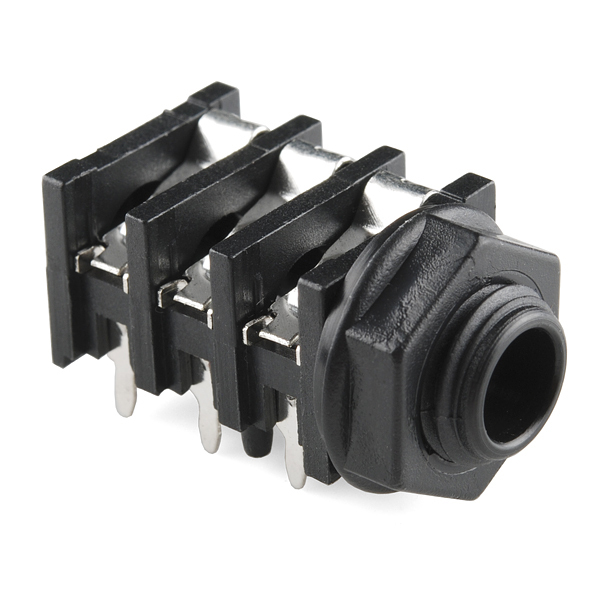 It is now in SparkFun-Connectors.lbr, as component AUDIO-JACK4-.25-HORIZ-TRS. Which of these leads is T, R, and S? I'm having trouble reading the datasheet (my eyes aren't as sharp as they used to be). The right hand set of pins are the connections. the closest to the panel is the sleeve. the furthest from the panel is the tip. The left set of pins are the normals, in the same order: sleeve nearest the panel, then ring, then tip. When no plug is inserted, the each normal ties to it's corresponding connection (Tip->tip normal, ring->ring normal, sleeve->sleeve normal). When the plug is inserted, these connections are broken. The connections are then tied to the signals in the jack, and the normals are left floating. Answering my own question: no they aren't. No problem. Great to know about the breakout! The spring contacts look to be better laid out and more reliable than the free floating fully exposed spring ones you see in other/older models. I cant say I like the plastic mounting bezel very much though. 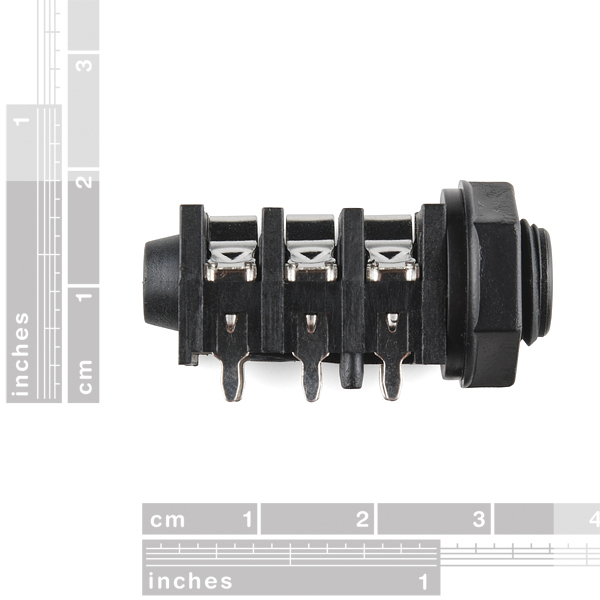 One, it doesn't match any other mounting bezels for most any other switch or encoder out there in style, two its plastic in one of probably the most heavily torqued items you would panel mount at all. If it weren't for the ability to mount via holes in the breakout board they also offer then I would have probably bought a different model. The breakout board for this item really saves it.